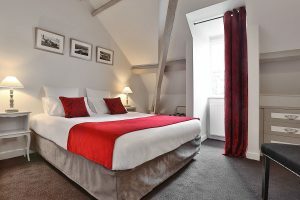 The hotel has 30 light, comfortable, quiet rooms and suites with top of the range services, terrace or small private garden on the ground floor, a magnificent view of the two valleys from the upstairs, will ensure a comfortable stay. Book your continental buffet breakfast for 14 euros, served from 08am to 10am. You can find 100% natural orange and apple juices, hot drinks, bread and pasteries from a local bakery, home made cake, yogurts from a local farm, home made fruits salad, dried fruits, fruit chutney, honey and chocolate spread, delicatessen and different types of local cheese, scrambled eggs and sausages. We can also suggest you room service breakfast for 12 euros, from 08am to 10am. It includes: one hot drink, orange juice, bread and pasteries from our baker, butter and fruit chutney. 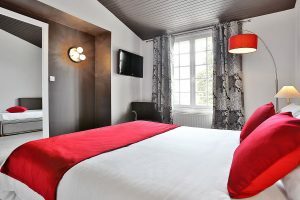 15 to 17 m², shower or bath, telephone, courtesy tray, flat screen TV and wifi. About 20m², terrace or private garden, shower or bath, telephone, courtesy tray, flat screen TV and wifi. 25 to 35m², living space, bedroom, shower or bath, telephone, courtesy tray, flat screen TV and wifi. A room with handicap access is being implemented.